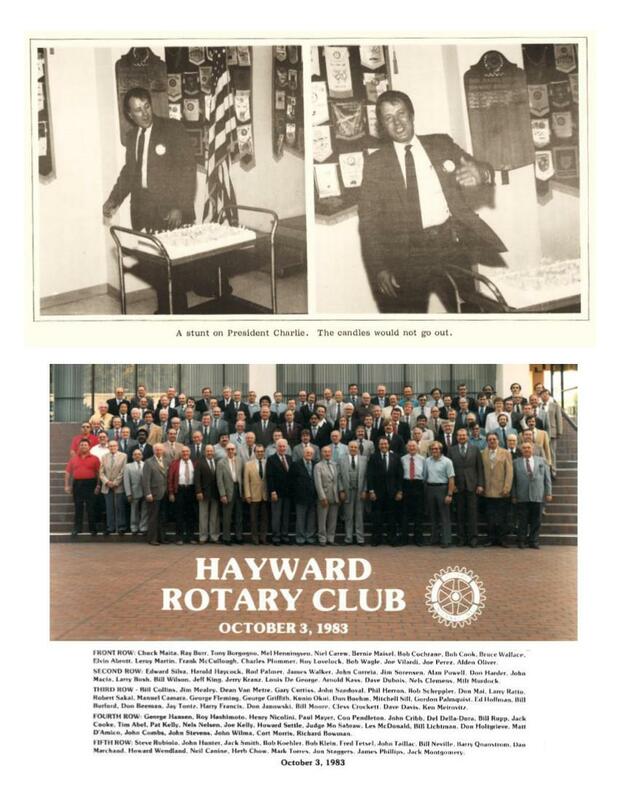 Hayward Rotary Club was founded in 1922, and has been in continuous service to the Hayward community ever since. 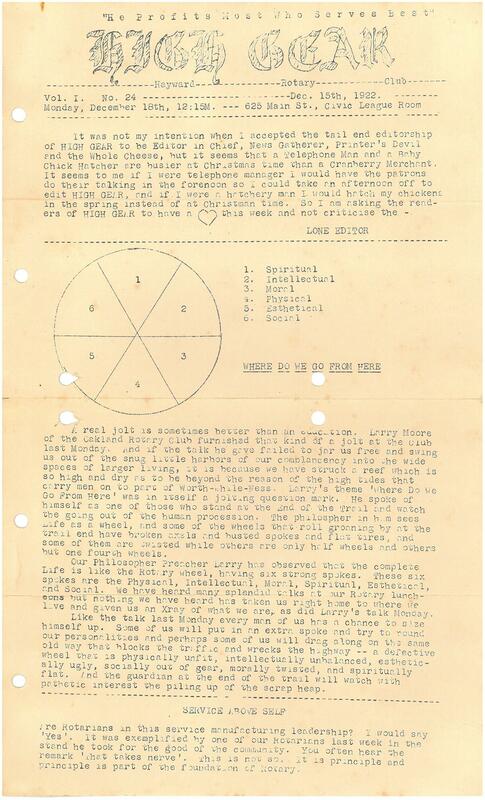 This page contains a selection of historic materials from our Club archives. 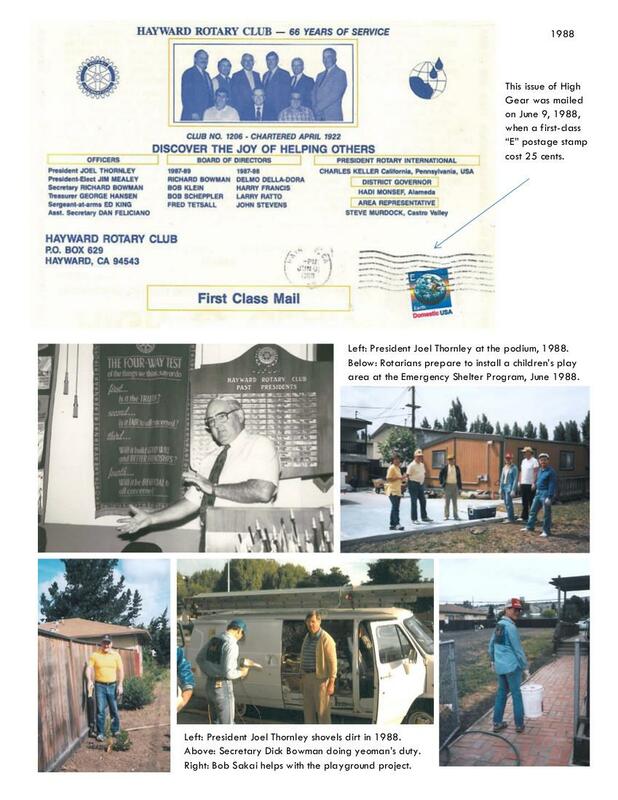 If you have interesting anecdotes, historical facts, stories, photos, documents, and other recollections to share in relation to the history of Hayward Rotary Club, we want to hear from you. Contact us. 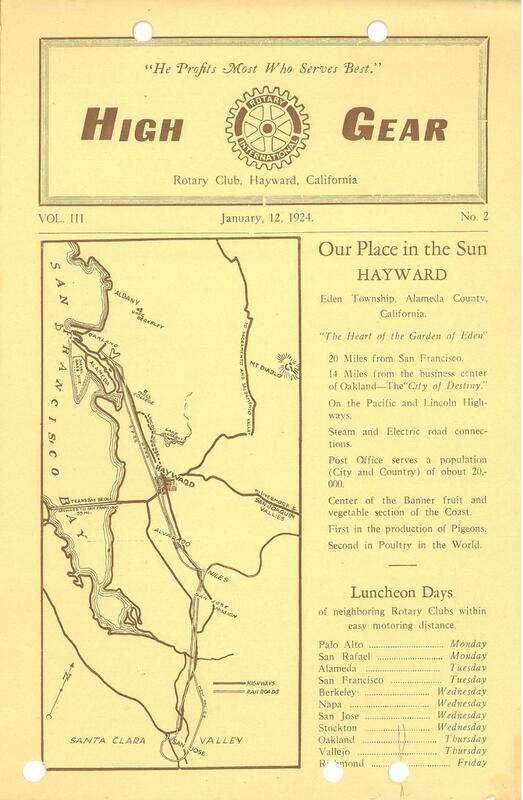 "Our Place in the Sun - HAYWARD". "New Administration Starts - President Bob Cook". 1926 - Hayward Rotarians at the old Lyon's Brewery, Hayward California. In this 1926 photo, Hayward Rotarians pose inside the old Lyons Brewery building, formerly located at the corner of Jackson Street and Castro Street (now Mission Boulevard). 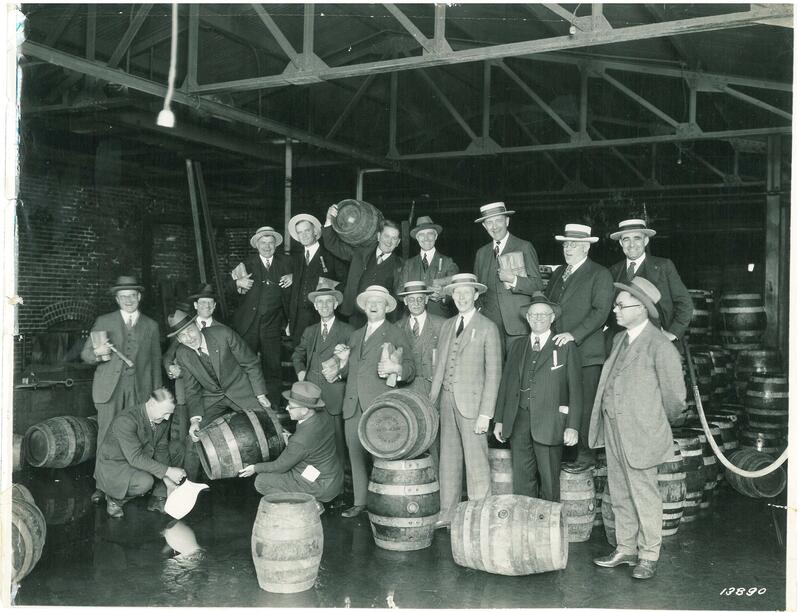 This photo was taken during Prohibition, so we're sure that's just root beer in those barrels. 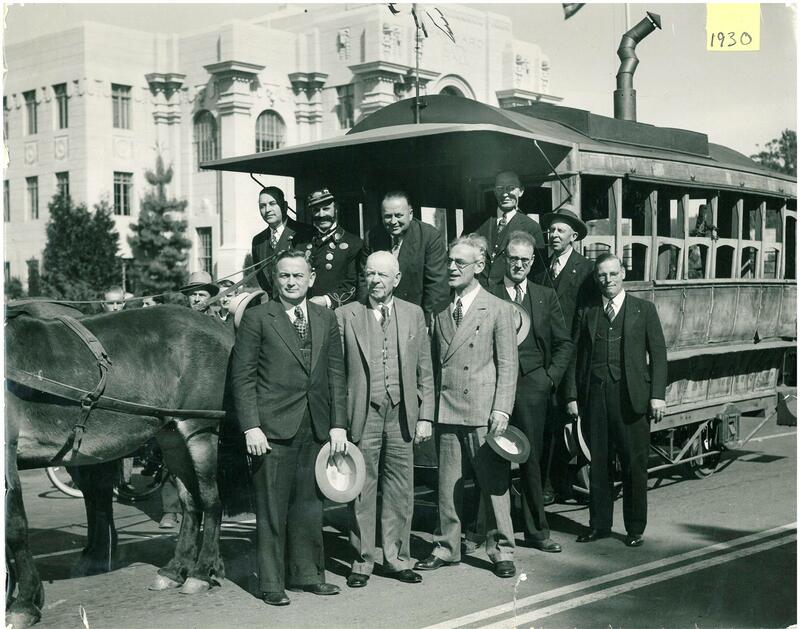 1930 - Hayward Rotarians pose with a horse-drawn carriage at Old City Hall, Hayward California. 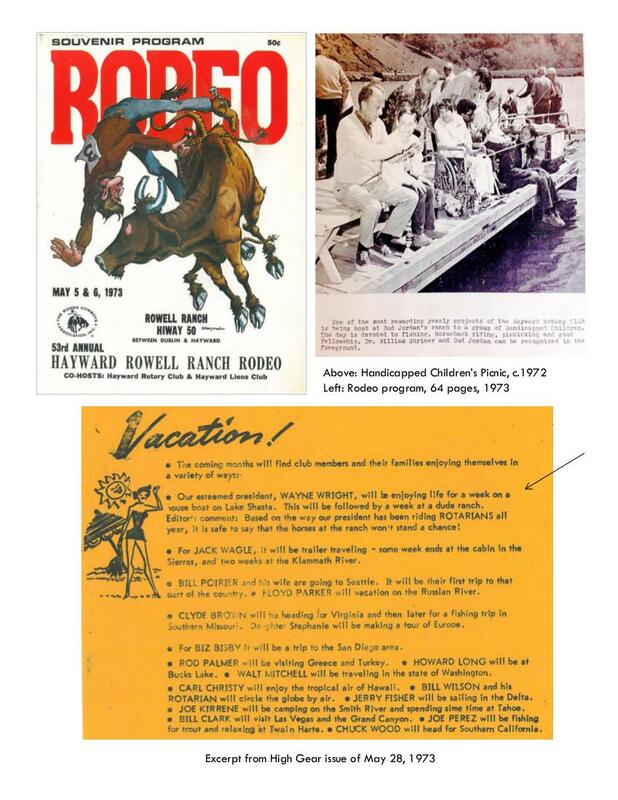 Hayward Rotary Club has a long history of horsing around. This 1930 photograph shows Hayward Rotarians posing in front of a horse-drawn streetcar on Castro Street (now Mission Blvd). The historic City Hall building in the background was newly built that same year. The horse-drawn streetcar was from the line that once traveled down the center of B Street from the train station at present day B Street and Meekland Avenue, through downtown Hayward with a spur to the Hayward's Hotel on A and Main Streets, then into the neighborhoods of upper B Street and back again. From the book, "50 Golden Years: Hayward Rotary Club", 1972. 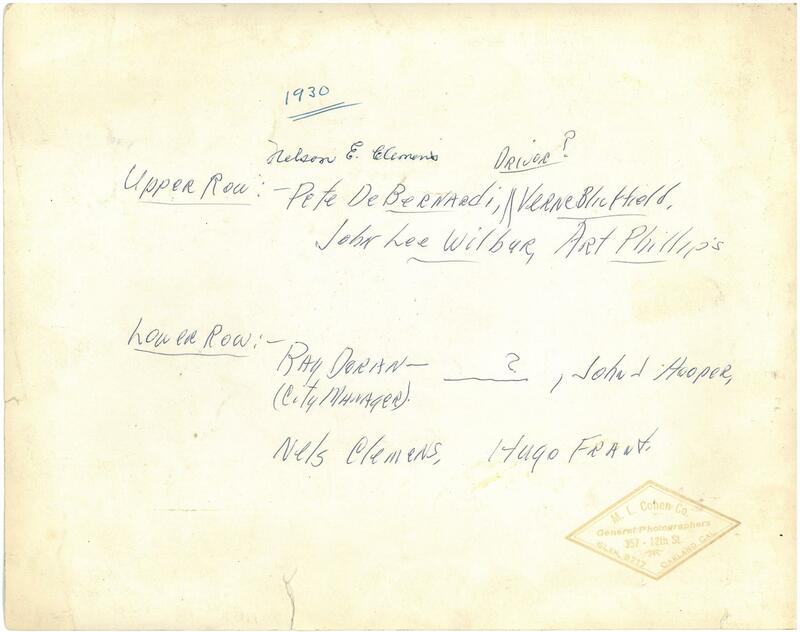 Eric Ruus, Jr. was a scion of the Ruus family, one of the founding families of the Mt. 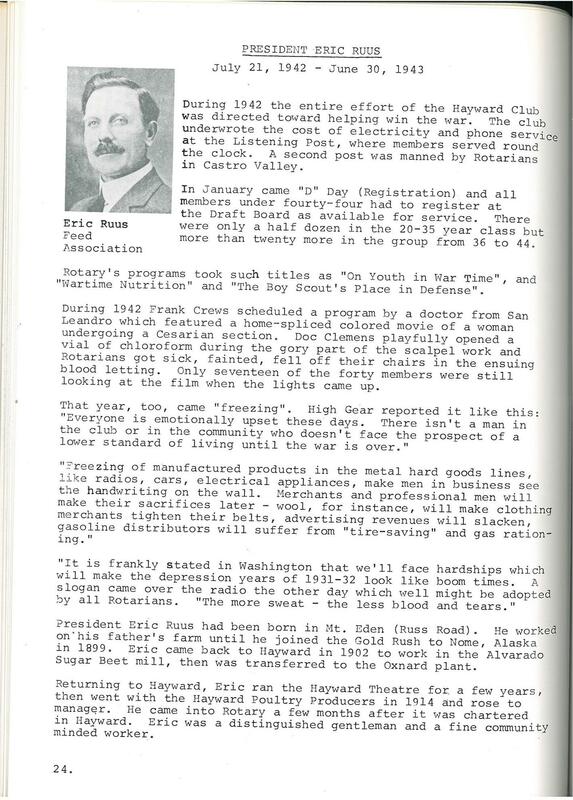 Eden area of Hayward, and a prominent local businessman in his own right. He was born and raised on the Ruus family farm in Mt. Eden in 1876. In 1899, Eric Ruus left home and joined the second "Gold Rush" to Nome, Alaska. He returned to Hayward in 1902 where he entered the local agricultural business as manager of the Hayward Poultry Producers association. In those years, Hayward was one of the largest producers of poultry in the world. 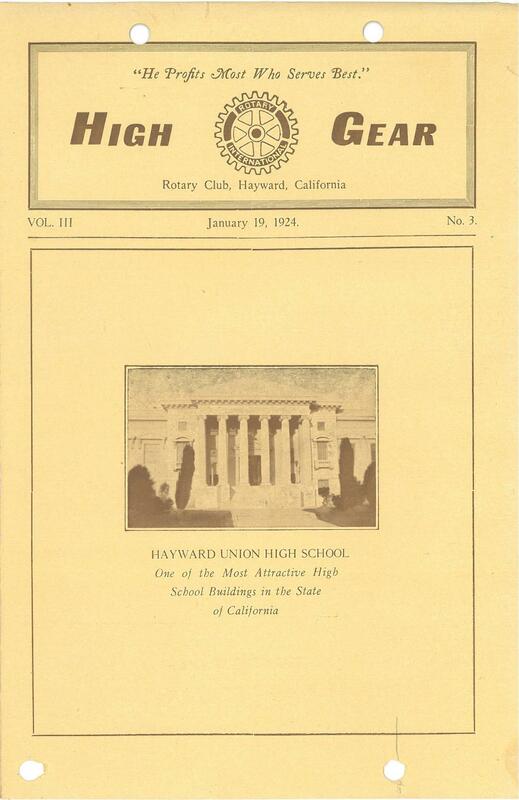 Ruus was one of the original members of Hayward Rotary Club, joining the year it was chartered in 1922. He served as the Club President during the World War II years 1942-43. 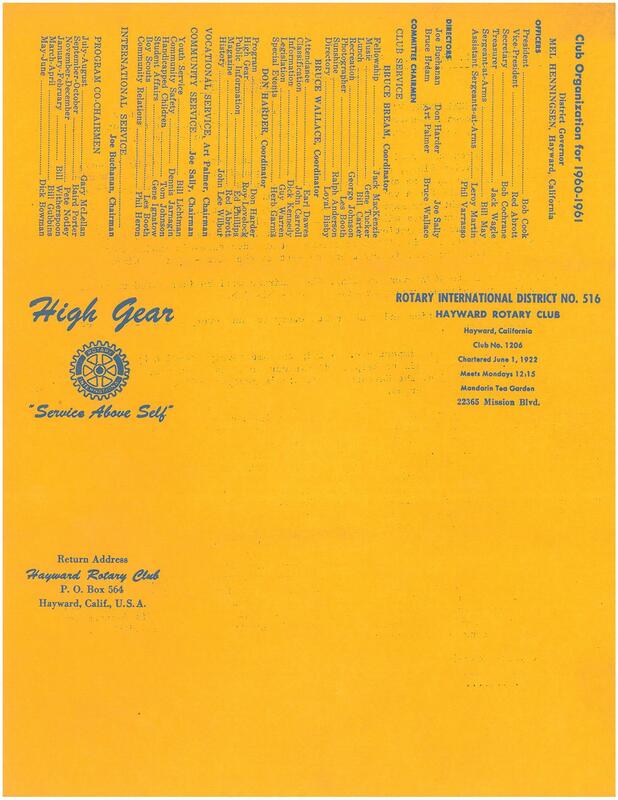 This biography of Ruus is from the commemorative book, "50 Golden Years: Hayward Rotary Club", published in 1972 for the Club's 50th Anniversary Golden Jubilee. In addition to describing Ruus' accomplishments during his year as President, the biography provides a glimpse into the grim realities of life in the United States during the onset of WWII. On the lighter (or possibly darker) side, there's also a humorous anecdote about a practical joke gone sideways when Doc Clemens applies a little too much chloroform. 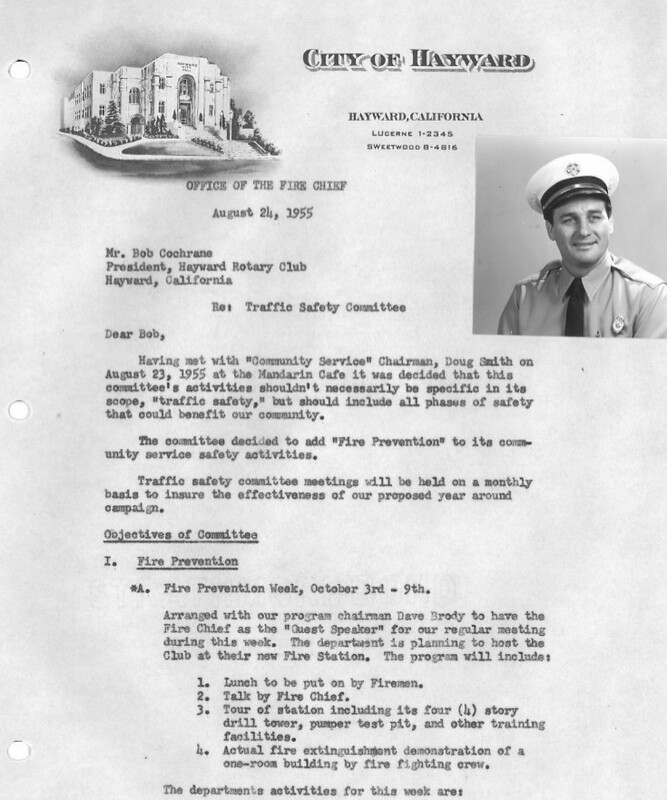 In this 1955 report, Hayward Fire Chief Matt Jimenez outlines the goals and planned activities of the Hayward Rotary Club Traffic Safety Committee for the upcoming year. After retiring from Hayward Fire Department, Matt Jimenez went on to serve on the Hayward City Council for many years. After his death in 2006, the Boys and Girls Club building on Ruus Road was renamed the Matt Jimenez Community Center in his honor.